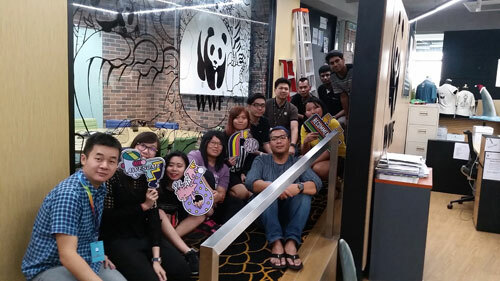 Students from INTI’s Centre for Art and Design (ICAD) recently had the opportunity to collaborate with WWF-Malaysia on an ambient design and enhancement project for the organization’s office located in Petaling Jaya. The project which commenced in August 2016, saw over 50 students and six lecturers from ICAD create visual communication for the lobby, meeting rooms, stairway and library of the globally renowned conservation organisation. Set across a span of a year, the project which took place in three phases saw the collaborative work of these students and their lecturers in producing banner designs for the lobby, external branding, glass doodles, sticker designs for the library, a 50-year stairway timeline infographic design for WWF-Malaysia and internal wall graphics for the office meeting rooms. 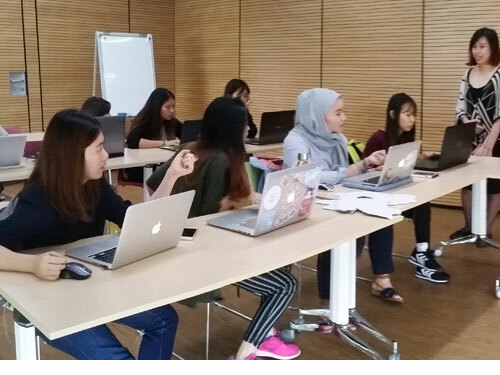 Coming from different pathways and academic levels, students from the certificate-level programmes all the way up to the degree-level programmes worked together on the employer project with practical guidance from their lecturers and representatives of WWF-Malaysia. The project simulated a client-briefing session in which WWF-Malaysia presented their brief to the students along with sharing the company’s background and requirements of the project. Beyond developing their design skills, these meaningful interactions lent tremendously in developing students’ soft skills in problem solving, communication, time management and leadership. The project also tested the students’ collaboration skills as they were required to work together in realizing the client’s brief and requests. “We believe these interactions are critical to help students gain real working experiences to help build up their self-confidence as future designers. Going through the real process of working with an actual client helped these students get a taste of what is to come in the future, while enhancing their creativity, design skills and ability to meet the brief presented by the client,” shared Ting Yu Ling, Head of Foundation in Design, INTI’s Centre for Art and Design. The three-phased project drew to completion and was well received by the WWF-Malaysia representatives who felt the students truly captured the message and essence of what the organization wished to convey in terms of creating designs that spoke volumes of the organization’s work in creating awareness on environmental issues, animal species from Malaysia and WWF-Malaysia’s 50 Years milestone. Through partnerships with over 450 employers, INTI students have been empowered with the right skills and tools to succeed in today’s highly competitive work environment. This is solidified in INTI’s graduate employability outcome for 2016, as validated by BDO, which shows 99% of INTI graduates being employed within six months of graduation, with 83% earning incomes higher than the market average, while 43% of graduates received job offers even before they graduate.